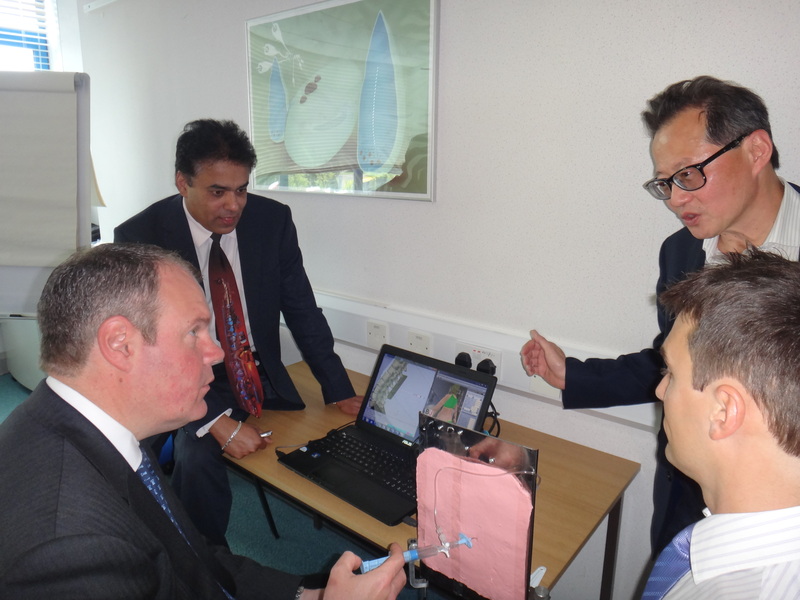 MP for Bournemouth West, Conor Burns visited BU to see the epidural simulator technology, developed by researchers in the Faculty of Science and Technology in collaboration with Poole Hospital NHS Foundation Trust. Over 1000 epidurals are administered each day in the UK, but it is a delicate procedure and if not performed accurately can result in debilitating pain, extreme headache, nerve damage and in rare cases even death. Unlike existing epidural training technology, the prototype simulator Mr Burns MP tried out (pictured) incorporates a patient’s weight, height and BMI. This is more realistic, making training more effective and thereby reducing the risk to patients. The simulator uses software to replicate the epidural experience, assisting in training for epiduralists to develop and enhance their skills. Coupled with a physical manikin, the software gives a realistic model for training. An accompanying training package allows trainee epiduralists to monitor their improvement. Mr Burns MP first visited the team three years ago when the technology was in its infancy. Since then Professor Michael Wee (Senior Consultant Anesthetist at Poole Hospital) and BU researchers Dr Venky Dubey and Dr Neil Vaughan have developed the devices and conducted clinical trials on laboring women. The information will be used to create a novel epidural simulator which is the second part of the project. At the meeting Mr Burns MP committed to drawing the project to the attention of the Secretary of State for Health, Jeremy Hunt, with a view to raising awareness and funding support. The project has already received international recognition, having been awarded the Institution of Engineering and Technology (IET) Innovation Award in the Information technology category, seeing off competition from more than 400 entries from 30 countries. The ultimate aim of the research team is to create a high fidelity epidural simulator with incorporated sound and vision true to the labour environment. This will increase the realistic experience of training, similar to that of a flight simulator. You can read more about the research and the devices here. Image (clockwise from top left) shows Dr Venky Dubey, Professor Michael Wee, Dr Neil Vaughan and Conor Burns MP.